After matching a season high in goals, the Vancouver Canucks hope to withstand two more potential defensive absences against the St. Louis Blues on Saturday in an effort to regain a share of the final playoff spot in the Western Conference. The Canucks (33-24-10) got a short-handed goal from Alex Burrows 37 seconds into the first period Thursday before five others scored in a 6-2 win over Nashville. The season high-tying production came after Vancouver totaled six goals in going 0-2-2. "We started with a lot of urgency, and urgency was warranted and needed," Canucks coach Alain Vigneault told the team's official Web site. "It was a very important game for us and our guys did what they've done throughout the year: they got ready to play hard." The victory moved the Canucks into a tie with the Predators for eighth place in the West with 76 points, but Nashville moved ahead Friday with a 2-1 overtime victory at Calgary, tying Colorado for seventh with 78 points. The Predators are idle Saturday, while Colorado hosts Pacific Division-leading Dallas. Vancouver will try to pull even with at least Nashville, but will likely have to do it without defensemen Mattias Ohlund, Aaron Miller and Kevin Bieksa. Ohlund, who leads all Canucks blueliners with 22 points, missed Thursday's win and is expected to be out at least four-to-six days with bone chips in his left knee, which could require season-ending surgery. Miller was leveled by Jordin Tootoo with 1:32 to play and went right to the locker room with an apparent shoulder injury. His status is still uncertain, but the incident triggered a fight in which Bieksa received an instigator penalty for scrapping with Vernon Fiddler. Bieksa's penalty carries an automatic, but reviewable, one-game suspension. The potential absences could add more pressure on Roberto Luongo, who made 21 saves against Nashville. The goaltender is 1-2-2 with a 2.66 goals-against average in his last five starts, but he is 3-0-2 with a 1.97 GAA in his last five at home. 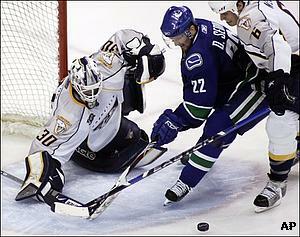 Luongo has won three consecutive meetings against the Blues (29-28-10) at GM Place, posting a 1.93 GAA. Daniel Sedin is looking to build on a three-assist performance that ended a four-game pointless stretch. The left wing, though, hasn't had a goal in a season-high seven consecutive games. Despite that slump, he still leads Vancouver with 26 goals and is tied with twin brother Henrik with a team-high 65 points. Daniel Sedin has three goals and seven assists in the eight previous games against St. Louis, including a goal and three assists in the last two - both victories. The Blues, who are 13th in the conference and fading from the playoff race, are looking to rebound from a 4-1 loss at NHL-leading Detroit on Wednesday, which opened their franchise-record, nine-game road trip. The defeat came one night after a 3-2 victory over conference-worst Los Angeles - their only win in the last eight games (1-6-1). St. Louis has been outscored 22-8 in the eight games, being held to one goal or less in each of the seven defeats. Brad Boyes - the Blues' leader with 32 goals - had only one shot Wednesday and has just one assist the last eight games, an assist against the Kings. The right wing, though, has two goals and two assists in the three season matchups with Vancouver. Manny Legace is also struggling during the eight-game stretch, posting a 2.70 GAA after going 4-0-1 with a 1.40 GAA in his previous five. The netminder has a 3.44 GAA during a personal four-game losing streak at Vancouver.